The Feed tab (or drop-down option, cant remember) has been gone for long time, but I didnt care much. The only thing I did think I get it right is the Post was now Discussion tab, that is completely wrong. They are entirely different things. I just used it for first time since its announcement two years ago for my channels About information. Now come to think to it, only two years, its already semi-removed, what a shame. I believe that eventually this page will be removed, this kind of subtle action has been employed by Google and its companies many times. They quietly remove something, but if you still get a URL, you still can use it, then one day, its all gone. The question is for how long? Its like they dont have the guts to do what they want and give out an explanation, cant take voices from users, so they do a trick like this. If you are gonna do it, just do it at one go. Few days ago, I noticed some mass strange hits on this blog, I thought its an attack. Earlier, the mass hits came again right after I posted Lightweight YouTube Player Loader. Its pretty clear to me, YouTube is the trigger. It could be post title or label name. The only issue is I still dont know who makes the mass request. Just one or a group of bots? Where did they get the published data. The requests came really just after I hit Publish button. Blogger Stats tab doesnt provide raw access log. Google Analytics cant help with this case, because those requests are not come from web browsers, therefore the script isnt executed, and definitely not from human. Hundreds of requests, who would have such time to hit reload button? They must be made by bots. I have thought if I change DNS record to other server, which I could see the detail with, the IPs. I do know they are from US, thats Blogger Stats tells me. I want to know if its one IP or many IPs, and who owns the IP. But that would affect too much, even its just a short period. Besides, I cant do anything, Blogger doesnt allow you to filter out unwanted data. They cant even classify those requests as bots even if there is a Bot tab, because those bots disguise themselves as Firefox and on Other Unix OSes. To me its like my stats data is being contaminated but this kind of data is still useful but not so much for a blogger if you cant have any means to deal with. 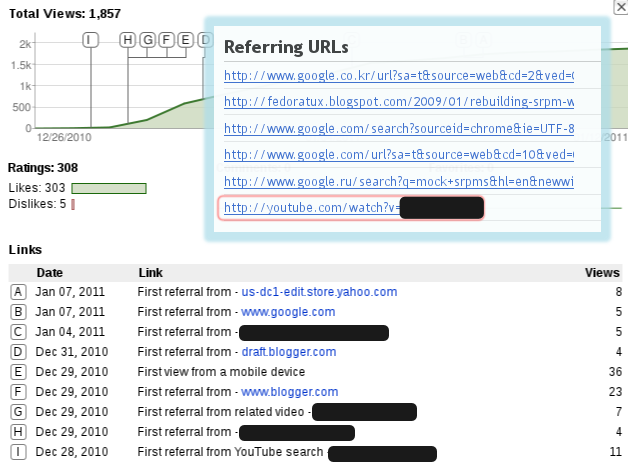 I dont think its spamming like fake referrer spamming (or the spammer forgets to add HTTP Referrer? ), at least not intent to spam Blogger bloggers, because it would know we cant know any detail except the number of hits, the fake user agent and the OS. In my conclusion, there is nothing I could do. I believe I will get another mass hits in just about a second once more. Lightweight YouTube Player Loader is a way to reducing resource usage on client-side. Its written for bloggers mainly because some may embed many YouTube videos in just one post. This loader doesnt load Flash player by default, which is loaded currently default YouTube embed. It accesses YouTube API and shows thumbnail as well as the title and author. This is a continued work after I posted about the loading time of YouTube player. A quick test of five 720p videos in one page, the video quality isnt matter since no video is loaded after YouTube player loaded. The YouTube players take 2+ seconds, this loader only takes 0.8 seconds. The memory usage in Chromium 9, YouTube player uses less than 20MB but 70+ for Flash player. This loader uses ~30MB, only one third. Experimental. Unexpected errors may occur, they should be seen as blank page. Please report if you encounter one. Showing thumbnail and slideshows of three thumbnails when cursor stays on iframe. Providing title and author information and a direct link to YouTube video page. All features of new YouTube iframe embed code will still work. Whatever the new code is, e.g. The loader reads the link and extract the video ID, then accesses API for video information. Title, author, link, and thumbnails. It will show the default thumbnail and render the title and author, also a link to video page on YouTube. If user clicks, then the loader put the original YouTube embed code on, then removes itself. When cursor stays on the loader for a while, it will change the thumbnail every a few seconds, so user can see some snapshots. You can view the source code (New BSD License) on GitHub. If you need troubleshooting help, please post to discussion group. Any idea or feedback also are welcome to post as well. If you find bugs or want to request a feature, please use issue tracker, instead. In any case, please prefix the subject of your post or issue with [g-yt-embed]. Unless its general to any video, say broken for any video, you must supply a YouTube video page URL which is affected, or your post or issue will be deleted and ignored. After I published the method using Vimperator, I found out it wont work if user switch to other tab before the page is loaded. The emulated keypress will be only emulated the currently active tab, and that may not be YouTube or Google Groups. Since Google Groups started the new interface, I removed that part of code from my Vimperator configuration, Google Groups doesnt steal focus anymore. Instead, I even enable Pass Through mode for Google Groups. A while earlier, I was seeking if there is a way I could open a link from commandline and Firefox does not raise its window. I havent found an answer for that but I accidentally stumbled on an answer on Super User and later I found how to disable form focusing on MozillaZine Knowledge Base. For a long time, YouTube and Google Groups always make me groan. I often ended up with searching something like o gm, I was opening Gmail actually. Their search boxes steal my precious control. If you are using that slow mouse&mdash;point, point, and click, you probably have never noticed that YouTube and Google Groups kindly help you enter the search box, they thought its convenient for users. Wrong! When most of sites dont help users with thatand why they dont? Think, YouTube and Google Groups! you are only creating burden for users. I use autocmd to emulate a keypress of Escape to exiting Input mode. I was hoping I could find a way to re-map a and A because I usually have to re-add bookmark after I wanted to Mark all as read using A, its a removal of bookmark. I couldnt find any, but the method above is acceptable. I just knew Gnash is 100% of all YouTube videos should work, its true. Also true for Flash Ads. I dont know if its about my hardware, drivers, or libraries, its performance is worse than Adobe Flash 64-bit. Yes, you can spank me, I am still using Adobe Flash 64-bit. I was aware Adobe decided to hold their support for 64-bit and I did not try to switch to 32-bit with nspluginwrappers help. I was risking myself. Anyway, I had tried everything I could with ~/.gnashrc. I had tried every combination for hwaccel and render. I even tried vaapi, even I knew its purely meaningless since my ATI X1400 is not supported, I was desperate. Here is some numbers. 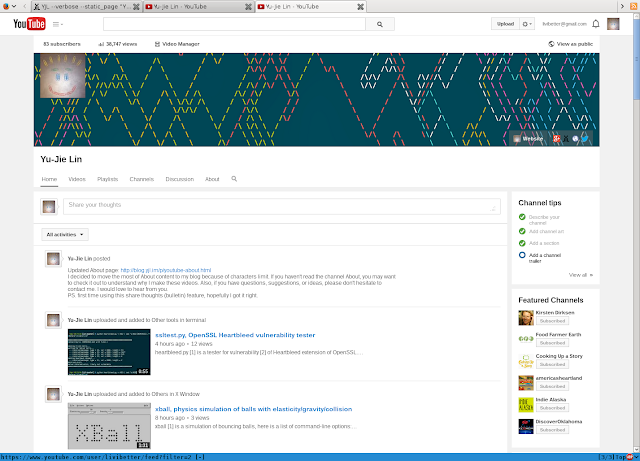 YouTube 480p using Adobe Flash 10.0 r45: 20-25%, 40-45% in fullscreen. My processor is a dual-core, so 45% means it uses almost one cores processing power. 360p using Gnash 0.8.8: 40%, nearly 100% and very laggy in fullscreen. If I use xv in mplayer for a 720p video, its around 20-25% in fullscreen. This is my second try of Gnash, first time was probably a year ago, it didnt work out last time. Next time I try Gnash, it will be version 1.0. I hope its just configuration thing, though I dont think so, but if you have same video card and it works smoothly for you, please tell me about your settings.